NPS right handed tablet arm stacking school chair offers a long-lasting plastic seat and steel frame. Sturdy 4-leg base. Stacks for storing convenience. Available in multiple colors. 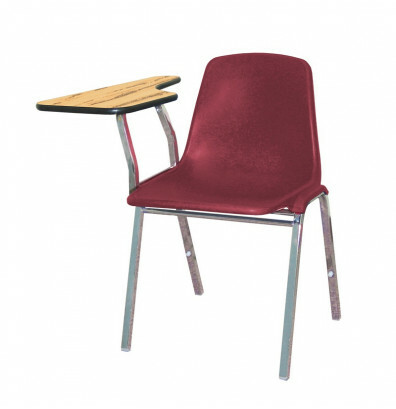 National Public Seating 8100 Series 11" x 23" tablet arm school chair features a one piece high-density polypropylene plastic seat. Removable right-hand tablet arm provides a writing surface. Chrome plated steel frame with 3 cross braces for added support. Shell and frame shields protect against snags and pinching. Sturdy 4-leg base. Stacks up to 12 high for storing convenience. Weight capacity up to 300 lbs. Available in multiple colors. These economical chairs are just what we needed to go in front of the Georgia Lottery KENO screen in our convenience store.